Brewed in collaboration by Danish brewery Mikkeller and Norwegian brewery Nøgne Ø. Appears a hazy orange toned amber with a small white cap that quickly fades out. Spotty bits of lacing are left around the glass. Smell is of water logged wood, cork, funky, sweaty socks, tart apples, and funky tart fruit. Taste is of the aromas with funky splendor abound. Mouth is tart, chewy, and dry with a linger of cranberries left on the tongue. From a 500 ml brown bottle, abv is 8%. This one was brewed at the Nøgne Ø brewery in Norway with enough lingonberries (or cowberry) that apparently the local news crew showed up to film the mountain of fruit going into the brew. Careful, this is live beer still, mine was a total gusher the moment I popped it open. Pours out a cloudy, murky russet brown, tight spongy pink head that settles to a thick cap with great retention. Sharp aroma of lingonberries, like a cross between cranberry, concord grape and an ambiguous dry earthy character. Totally works with the Brett. Things tend to bottom out with the flavour. Starts out with a clean tart spritzyness, but the heavy earthyness of the berries tends to neutralize this in the middle, while some sourness of the yeast sneaks out on the finish, with tart berries lingering on in the aftertaste. Everything is dry throughout. Medium-bodied mouthfeel, dry with light spritzy carbonation, becomes sticky on the finish and aftertaste. Very possible that these fermented lingonberries aren't jiving with my N. American palate, but personally the overall effect isn't working for me. I think perhaps they may have used too much fruit, as the normal tartness of these berries would be an ideal marriage with a lambic. Might have sampled it too early, might have sampled it too late, it is what it is. The beer pours a hazy amber/red color with a thick frothy off-white head that slowly fades to lacing. The aroma is good. It has a mild sourness along with a light cranberry essence. The taste is decent. It has a powerful sour punch that hits you up front. It's very light and quaffable despite the 8% abv. . The cranberry flavor is muted and mainly in the background. There is an earthy feel in the finish that really takes away from the overall taste. The mouthfeel is decent as well. It is a low/medium bodied beer with good/too much carbonation. This is a pretty good beer, but I expect better from these guys. Apricot orange with a cherry blush and a crackly crown of pale pink foam that isn't sticky enough to grace the snifter with much lace. The beer is an interesting hue, but the rest doesn't impress. The nose needs time to blossom. Eventually, the tangy berries, the modest barnyard quality of the wild yeast (Brettanomyces), and the slightly different funkiness of the bacteria (Lactobacillus) are able to be appreciated. Gotta go with 'interesting' again. 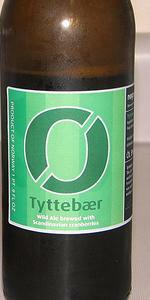 Tyttebaer is not one of the better wild ales in the world, no matter the country of origin. Again, the various ingredients are noted on the taste buds, they just don't interdigitate all that well. There's too much tartness, not enough berry flavor, and not enough funk. This is... wait for it... interesting ale, but it isn't especially well-crafted ale. The flavor isn't bold, deep or complex. This collaborative effort tastes like a wheatwine with a shot of cranberry juice and a wee pinch of funk. Age (roughly 15 months) might have caused some flavor deterioration, but these wild ales usually hold up pretty well. The mouthfeel is thinnish for the ABV and is too boisterously bubbled. Time and warming don't seem to be helping either one. A bigger and creamier brew would have lengthened palate contact, which might have helped in any number of ways. Tyttebaer is both Danish and Norwegian for lingonberry, which is a mountain cranberry grown in that part of the world. This is a better (and more interesting) beer on paper than in the glass. As we all know, the glass... then the mouth... then the belly... are really the only places that matter. Batch #337, brewed on 300108. When pouring the beer, the foam makes a harsh loud sound while it quickly sinks down. No lacing. The clear liquid is brown-red with a tint of purple. The smell is very dry and sour with lots of minerals and metals like iodine, iron and wet coins. Some sour fruity notes of lingonberries, chalk and plums. The taste is earthy, mineralic, very dry, lots of stable/horse-flavours. Hints of lingonberries, apricots, raisins and plums. Dry sour lambic-flavours with hints of mild vinegar and wool. The aftertaste is dry with metallic sour flavours and fragile hints of fruits and berries. The carbonation is very strong; the small bubbles fade quickly. The liquid is dry, almost astringent. An interesting take on the fruit lambic/wild ale style. I had hoped for more lingonberries though. A collaboration between Mikkeler and Nogne made with mountain cranberries (lingonberries or tyttebaer). Many thanks to John for bring this over. Appearance: Pink brown body, opaque, no head at all. Actually pretty ugly. Aroma: Awesome. Super funky rubber and acidic fruit. Circuit board notes. Taste: Subdued. No distinguishable fruit flavors...odd. Rubber band and floral notes. Not as funky as I thought it would be. Very mild tasting. I would like more fruit and/or more funky flavors. Mouthfeel: Bone Dry, light bodied, flatish front with tiny carbonation that stings at the back of the palate and in the finish. Reasonably tart but not nearly as funky as the aroma would indicate. Almost gushing on pour, only some quick thinking saved it. Pours a red-tinged amber colour, very cloudy, with a frothy and lively head of lightly pink foam. Lacing is good. Carbonation is vibrant. Looks pretty good overall. Huge acidity and funk on the nose, with sweeter notes of rosewater and fairy floss. Very much full of sour fruit characteristics, with some very distinct sour ale funk to it as well. Wow, this is one riproaringly wild ale on the nose. None of the acidity on the palate, but huge oak characteristics, with dusty yeast and organic funk to it, with a lingering grapeskin bitterness on the back. Pretty dry on the finish, with those big woody oak characteristics sticking around untill there's only oak, and no beer left. Phew. Mouthfeel is carbonated and sparkling, but not overwhlemingly bubbling, given that it was so lively when opened. A pretty nice Wild, I have to say - it could use a bit of acidity on the palate, but I'm very glad it wasn't as sour as the nose suggested it may have been. The dryness is welcome, and I like that it has such a refreshing profile as a result. A very nice Wild Ale. Bottle was a gusher when opened. Poured with a huge head (!) and no lace. Color is a slightly hazy amber. Aroma is yeast malt and brett. Flavor is just like aroma. Body is just crisp and highly carbonated. Finish is like flavor. Fairly simple beer. Not a session for me. Strange that it's called an american wild ale. This is clearly an import. Wild ale with fruit seems more like a Belgian lambic. Beautiful redish orange.Fizzy bubbly head. Tart or sour smell- Lambic. Fruity medicinal scent like powdered e-mer-gency health drink. Sour-tart. Like choke berries. Dry and funked. Hard to compare to a lambic. Almost tannic cran-raspberry fruits. Some hints of vanilla. Acidic. Complex and sneaky at 8% alcohol. Great pick for Turkey, mashed potatoes, pie, etc. Batch nr and brewing date spaces are empty. 500ml brown bottle. As implied above tyttebaer is the same fruit as lingonberry, the former being both Danish and Norwegian while the latter is Swedish. The label says "Scandinavian cranberries". A: Hazy golden amber hue with a tinge of lingon red. Small tan head leaves minimal, persistant lacing. S: A pleasure to inhale. Faint malts and hops, enveloped by a tart, tangy and somewhat sweet on/tyttebaer aroma. T: A wild ale indeed. Nice and sour with a sweet initial taste that quickly turns funky and tart. M: A bit on the thin side as it swirls around the mouth. The dry finish is pleasing on the palate. D: This was a definite sipper. In order to savor the unique scents and flavors, it is best to let it warm up a little. One will do it for me. Consumed in my Jämtlands Bryggeri (one of the best Swedish breweries, located in the eponymous central western province that borders on Norway) tulip, watching Olympic hockey, in honor of the men from the land of lingon. A - A hazy and very rosy amber brew with a lot of visible carbonation. The head is large, but thin and short-lived. No lacing. I was worried it was a gusher when I uncapped it because the carbonation started a slow moving expansion of foam through the bottle. S - Cinnamon and cranberries stand out as the dominant odors. Smells a bit musty too, like a hint of slowly decaying wood. T - Very sour, almost no sweetness. I think some is from the brett and some from the tart berries. It is puckering throughout. Aftertaste sees the tartness fade - not entirely, but enough for other flavors to speak. There is a maltiness with some faint pithy hop bitterness. M - Initially the high carbonation was stinging, but like the head, this subsided quickly. Thin and dry. Pretty refreshing. D - It wasn't an unpleasant experience, but not likely one I will repeat. A small gusher upon opening. Color is a hazy ruby/orange with a short, white head and little retention. Lots of carbonation. The smell is tart & fruity from a distance at first. Later I get a leather like smell as well. The taste starts off nicely with a tart & sour flavor from what I guess is the Lingonberries. (Guess I need to eat at the Ikea restaurant to be sure.) Upon swallowing there is a very light bit of funk and something not quite pleasant in the taste that I can't figure out. There is also an aftertaste of scuppernong grapes. Mouthfeel is pretty effervescent and very dry. Drinkability is OK but it's unique enough to be one & done. 500 ml bottle. Served in a tulip glass, the beer pours a cloudy reddish/brown color with about an inch and a half off-white head. Head retention and lacing are both pretty good. The aroma is fruity and a bit tart and funky. It smells like tart and sweet lingonberry/cranberries, funk, and a bit of mint. I think the taste is pretty much the same as the aroma, but the berry taste is the stronger than the others, and I also notice a bit of an earthy/woody taste in this brew. Mouthfeel/body is medium, it's well carbonated and also slightly dry. Drinkability is good, I thought it was easy enough to drink. I think this is a good overall brew, it's definitely worth a try. 16.9 oz. bottle, uncertain of the date/batch because those designated spots are left blank on the back label. No recollection as to where this was purchased, but I estimate about 1 year ago, give or take. Cellared ever since. Poured to a wide goblet. 'Wild Ale brewed with Scandinavian cranberries' (listed as lingonberries on the back label - also includes Brettanomyces & Lactobacillus). Further description: "This ale is full of Tyttebær, and fermented with wild yeasts and bacteria. Feral at heart, it sat in fermentation tanks for 9 months and in bottles for 6 more months before we felt it was ready to be released. Who knows what it will do before ending up in your glass... It is, and always will be, wild." A: A misplaced uncapping (i.e. not directly IN the sink) means some countertop cleanup. Maybe an ounce lost. Or two. No worries... Pours a rosy-auburn, like cedar heartwood, murky and unfiltered without any notable yeast fallout. Not the tallest head, less than half a finger of ivory cream, but plenty of staying power - indicating the the barely visible carbonation is busy at work replenishing that topping. A few dabs and squiggles of lace. S: Tartness in the nose isn't too forceful, more the gentle perfume of berries and citrusy cultures. A crackery/bready backing. T: Honestly hard to discern 'lingonberry' from some other berries, but the end result is a balanced tart & sweet fruitiness that winds up tasting of a scone with that mouth-drying malt/yeast mix. Kinda wish it had highlighted this particular berry more (as it's a favorite from visits to Sweden... and IKEA) rather than a more generic 'tartness' (berry? apple?). M: For an 8% (really?!?!?) beer, the alcohol is hardly notable. Feel is medium-bodied - crisp, well-carbonated (maybe a little overdone) and quite refreshing. I was hoping for slightly better things with this beer. It looks good and pours a slightly hazy amber color and a nice fizzy head that does retain. Not much lacing. The nose is really loaded up with Bretty yeast, some vinegary notes in there, maybe a touch of berry, but it is the yeast that predominates. This is truly a wild ale and I wasn't anticipating that, actually hoping for something more refined. The taste is plenty carbonated, or at least it has that ultra prickly mouthfeel from the yeast and efforvescence. You can't but sip this beer given the coarseness in the mouthfeel, but this isn't a bad thing. The beer is fairly light bodied, the back end is modest with nothing lingering too long on the tongue. There is a definite berry quality to the beer. If you say Lingonberry, who am I to argue. The berry flavors are a bit undefined. The beer is loaded with Bretty yeast and a drying minty and vinegary bite that is a byproduct. The prickly mouthfeel, the slightly sweet berry flavors, the fairly light bodied-ness of the beer, and that over the top Bretty yeast really define this beer. Things mellow just a bit as the beer settles, but not by much. I'm not a big fan of Wild Ales and this beer is just one more confirming example of why that is so. If you like Wild Ale, if you like Bretty yeast with all of its vinegary qualities, if you like a light bodied beer that hides its 8% ABV very well and doesn't have any real boozy qualities at any point in the beer, than this one might fit the bill. It isn't my cup of tea. Pours a murky, cloudy bronze colour with pleasant beige head, dense bubbling looks similar to frozen Coke. Sinks quickly, leaving rings of thick, foamy lace behind. Almost opaque from the haze, yeah an interesting wild brew. Nose is sour and kind of funky. A lot of barnyard character - hay and corporeal, salty notes with a good dose of pleasantly tart, fresh fruit. Good berry character, blackberry and juniper with a hint of pear and a citric tang - although not a lot of citrus aroma, just that sharp acidity. Pleasant and refreshing with a good sweetness underlying it all. Taste is nice and refreshing, a lot of tang and twang, snap crackle and pop throughout the palate. Starts with fresh tartness, lemony with some bite. More fruit character comes through midway with distinct berry flavours, raspberry and underripe blackberry for some crisp, if a little puckering, flavour. Finishes with a distinct rindy bitterness, almost cheese-like but without the pungency. It is the most unlikeable part of an overall really fresh, drinkable sour. Has a distinct bite to this with a bit of palate-tearing acidity, almost bordering on Cantillon puckering. With a good gulp, it foams up nicely to provide a layer of protection but otherwise I wouldn't keep this in my mouth for long. Poured from a 500ml bottle into a Mikkeller tulip. A: Pours an opaque, burnt-orange with an impossibly creamy and pillowy dark khaki colored head on top. Retention is fantastic! Gobs of sticky lace were left clinging for dear life to the inside of the glass. S: Smells of tart earthy berries, funky barrel, vinegar, chardonnay, juniper, and wet bark. T: Tart and tangy berries, dry/roasty malt, tart cherry, sodden oak, and hints of skanky funk. Notes of lemon come on in the middle and on through the finish. As it warms the tart berry flavor takes on a decidedly spicy edge. This isn't spiced but it tastes like the earthy and naturally spicy berry flavor comes out when it approaches room temp. M: A tad on the thin side at first, but it thickens considerably as it warms. This stuck itself all over everything in my mouth. D: I really enjoyed this as it hovered around just slightly warmer than cellar temp. Very interesting collaboration between these two breweries. 500ml bottle into tulip glass. Bright pink/orange color, good clarity and hefty amounts of carbonation. Big three finger white head on a nice rough pour, moves down slowly w/o leaving any lacing along the glass. Solid cap of caps the body of the beer. Nose just pops out of the bottle and the glass. Mouth watering, salty, sweaty, tart. Like sweet tarts. Strawberry, fruity. Makes the mouth pucker. Flavor is like the smell. Tart, dry, slightly hoppy. Good easy drinking. Very fresh. Some bitterness from the cranberry. Somewhat like carbonated, under ripe grapefruit juice. Not as complex as the aroma, but very refreshing & enjoyable. Feels quite carbonated yet well held together. Very drinkable. A - A healthy puff of CO2 and a slow gusher upon opening. Pours with two fingers of slightly off-white head on top of an opaque, glowing copper-red body. The foam displays good retention and leaves light lace. S - An odd, sinus clearing aroma of mint and licorice with lots of herbal spice notes and musty funk. Wet dirt, cinnamon, clove, allspice, and horse blanket. T - Lots of tart cranberries up front with a hint of jam like sweetness and some raspberry character that marks these as lingonberries rather than the American cranberry. Some funk comes out in the middle with surprisingly mild tartness and the odd mint/licorice character from the aroma. Finishes slightly tart with some residual sweetness and a hint of hop bitterness. Berry flavors linger on the palate in the aftertaste with some surprising nutty malt. D - This is a beer like nothing I have ever tasted before. Eminently weird with a distinct contribution from its eponymous scandinavian fruit it ends up being oddly compelling and drinkable. The strange spiciness and the really nice, complex fruit character work well with the restrained wild yeast character. I don't know that I will be buying a bunch of these to stock my cellar with (I would be kind of afraid of bottle bombs considering the way this one gushed) but I will definitely savor every sip of what is left in this bottle. A - Pours a dark copper colour with a very active fizzy head that disipates quickly to nothing. S - Berries and more fruit,with a little funk. Very pronounced. M - Very spritzy with light to medium body. O - This beer has stood up quite well and retained many of its flavours. I'm glad I bought it. Drank from my Duvel tulip. A - Pours a cloudy yeloowish red colour almost pink. HAs a pink tanned that dies but laces. S - Plenty of berries and some sweetness to it. T - An almost medicinal flavour that is hard to describe, finishes in a very bitter way with some sourness, siome peach and berry in between. M - Light body and full carbonation. D - By the end of the bottle I was seriously won over. This is a funky beer if you are looking for something a little different. Pours a cloudy orange amber with a fairly good head that sticks around. Made with Brett and Lactobacillus as well as both malted and unmalted wheat, malted barley, hops and lingonberries. Smells tart, a bit like a bitter cranberry. Citrusy, earthy, and a bit like a forest with loam and pine. Very nice flavors of tart fruit, pine, earth, and some barnyard. Nice bitterness throughout and the lingonberry flavor is like a piney, uber-cranberry. The sourness from the Brett is light, but the tanginess from the lacto is a bit more pronounced and there is some light funk from the brett. Really like the fruit and deep, almost juniper-like pine flavors. Tart and very bitter in the mouth-bracing. Quite a delicious brew from this very cool brewery.